Holyhead Coastguard requested the ILB launch to a male having difficulty rowing against the tide in Rhyl harbour, as he tried to recover his speedboat which had broken it’s mooring and was drifting. Reports came as the ILB was being launched that the man was in the water, so the ILB proceeded with best speed into the harbour. As the crew arrived on scene, the man was now ashore and safe. The drifting boat was recovered together with the broken mooring buoy, and the boat was tied to the visitors’ pontoon temporarily. The man was spoken to by local coastguards, and required no medical care, so the ILB returned to station at 1301. A member of the public reported to Holyhead Coastguard that there was a small boat adrift in Rhyl harbour, and with the ebbing tide and offshore wind, it would probably go out to sea. The ILB was requested to investigate. The crew found the dinghy at the entrance to the harbour. It was a tender to one of the local boats which had come adrift, but there was no sign of recent use. The Crew returned the dinghy to the visitors pontoon and returned to station after a quick look round the harbour at 0910. ILB requested to launch after a dog entered the water off Golden Sands, Kinmel Bay, and got into difficulties, with the owner threatening to go in after it. As the crew were assembling, Holyhead coastguard reported the owner had gone in and had brought the dog ashore. The ILB was therefore stood down. Classed as standby. ILB requested to launch to a small speedboat, aground on the sandbanks of the River Dee estuary off Talacre lighthouse. On arrival on scene, there were 2 people standing near the craft, but when the ILB crew questioned them, they said they saw the boat and came to look at it. 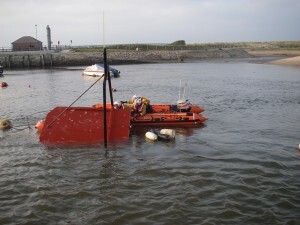 The boat was therefore abandoned, but, as the tide was coming in, the boat floating free would pose a hazard to shipping entering the port of Mostyn. The ILB crew waited for about an hour, and then towed the boat as it rose on the tide, and towed it back to Rhyl, where it was passed over to the local Coastguard team. Pictures show recovery at Rhyl. On 9/9/2010. Our station ILB D-632 was returned from Poole depot after repair, and ILB D-630 was returned to the relief fleet. ILB launched to assist police and coastguards search for a 3 year-old girl separated from her party on Kinmel Bay beach. She had been missing for half an hour near the water. The units searched for about 15 minutes before the police reported they had located the child near Sunnyvale camp beach, all units were stood down, the ILB returning to station at 1640. Rhyl beach lifeguards requested the launch of the ILB to 4 males in 2 child’s dinghies, about 300m off the boathouse, with an offshore breeze and incoming tide. The 4 were making no headway back to the beach, and so the ILB launched, taking them on board, and recovering them and the inflatables back to the beach at 1615. The ILB was ready for service at 1625. ILB launched to a child being swept out to sea by the offshore wind off the Children’s Village, Rhyl.2 Rhyl Lifeguards had entered the water to go to the child, and as the ILB arrived, had managed to tow the child back to shallow water. the ILB was therefore released to return to station, when, at ….. The ILB was re-tasked to assist another lifeguard who had gone to assist the first child’s mother, who had run to the water, and was up to her waist when she got stuck in the mud in between 2 covered sandbanks. The ILB crew went to the scene and took the mother and the lifeguard on board, and returned them to shore. The ILB was returning to station when, at ….. The ILB crew saw 1 adult and 2 small children cut off by the incoming tide opposite the Sun Centre at Rhyl. They were taken on board the boat and returned to the shore. The ILB finally returned to station at 1555. Rhyl beach Lifeguards reported a 28-feet fishing boat apparently having engine problems as it left Rhyl harbour. The boat got about 1/4 mile out when it stopped, and the occupants appeared to be looking into the engine compartment. The coastguard requested the ILB check it out. On scene, the 4 persons aboard said they were OK and were just starting fishing, drifting with the tide. The ILB returned to station as all was well at 1425.Immediately after the ILB had left, the boat returned to Rhyl harbour under it’s own power. Rhyl coastguard mobile patrol reported 3 adults and 2 children cut off by the incoming tide off the boathouse. The ILB arrived on scene to find the people had just managed to wade ashore, getting soaked as the gutter between the sandbank and the shore was quite deep. 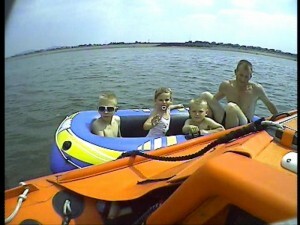 The adults were seemingly unconcerned as to their possible danger, and were given strong safety advice by the ILB crew. The ILB returned to station at 1908. ILB requested to launch to assist police with a female up to her waist in water off Rhyl promenade. As the crew were just about to launch, Holyhead coastguard reported that the police had the woman in custody and the boat was stood down. The ILB returned to station at 0835. ILB launched and AWB on standby to search for a family of 4 off Presthaven Sands, Prestatyn, apparently cut off by the tide and lost from sight. The ILB was towed along the beach to Prestatyn Barkby beach, and was just launching when the coastguards received a message saying all were safely back at the camp site. the AWB was stood down, and the ILB returned by road back to Rhyl. The crew and thousands of spectators were enjoying Rhyl’s Air show, when a speedboat with 3 people on board entered the “no-go” restricted area of the flying site off Rhyl. The ILB was launched and, after a chase with the occupants repeatedly coming back into the area , the crew caught up with them and told them to leave the area for safety reasons. The ILB then returned to the beach, but could not return to station until a display had finished, this being at 1528. ILB requested by Holyhead Coastguard to assist beach lifeguards with a person stuck on the rock groyne at the Nova centre, Prestatyn, beach. Just as the crew were assembling, it was reported the lifeguards had successfully recovered the person back to the beach, and the launch was cancelled at 1440. Classed as standby. 2 people on Rhyl promenade called Holyhead Coastguard to report an object just outside of the training wall marking the entrance to Rhyl harbour, with what looked like a boat with someone in it. 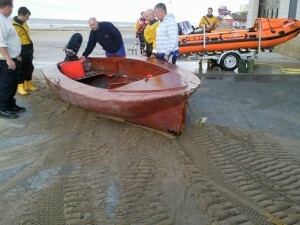 The ILB launched, and was directed to the object by Rhyl local coastguards. It proved to be a large tree trunk with branches pointing upwards. Once all was checked out, the ILB returned to station at 2308. ILB launched to a kite surfer off Kinmel Bay. He had been in the water for 20 minutes, about 300m off shore, and was struggling to swim ashore. The ILB arrived on scene just as the man managed to get into shallow water, and so they returned to pick up his kite, and returned it to shore. The ILB then returned to station at 1818. ILB crew paged to assist Rhyl lifeguards with 3 children stuck on the rock groynes off the Nova centre, Prestatyn. The ILB crew were assembling as the lifeguards reported they had assisted the children back to shore. The ILB was stood down at 1130. Classed as standby. ILB launched at request of Holyhead Coastguard, to a yacht with 2 people on board, not making any headway in the shipping channel to Mostyn port, off the Nova centre, Prestatyn. The ILB crew went alongside just as the yacht crew had started their engine. They had indeed been drifting, but all were OK. Once the yacht was underway, the ILB returned to station at 4632. ILB launched to 3 males in an inflatable dinghy, being blown out to sea off the Nova centre, Prestatyn. The ILB arrived on scene just as they were managing to get to shore. Once all was checked that everyone was OK, the ILB returned to station at 2003. The woman was reported to have eluded shore teams and was headed back to the shore, so the ILB re-launched to commence a search. They were half way to scene when the woman was reported to be found about 1 mile to the West of her last reported position, but she was now in police custody. All units were stood down and the ILB returned to station at 2355. On 22/6/2010, our station boat D-632 “Godfrey and Desmond Nall” returned from refit at Cowes Depot. D-622 “Guardian Angel” was transferred by wagon to Newcastle, Northern Ireland, to take up relief duties there. ILB requested to launch by Holyhead Coastguard to assist lifeguards recover a man trapped by the incoming tide on a sandbank off the boathouse. The crew arrived at the shoreline to find the man had been safely brought back by the lifeguards. the ILB returned to station at 1105. ILB launched to assist police and coastguards search for a young male apparently entering the water at Splash Point, Rhyl. The male was in a distressed state, but there was some confusion with the emergency services regarding the actual circumstances of the search. The police eventually located the person safe ashore near the promenade, and all units were stood down, the ILB returning to station at 0045. ILB crew requested to launch to back-up coastguard teams from Rhyl, Flint and Llandudno, search for a missing male who had been missing from the Prestatyn area for some while, and was apparently going on the beach. The teams were later joined by the Rescue Helicopter from RAF Valley who conducted an infra-red sweep of the sand dunes. The teams searched for nearly 2 hours, when North Wales police reported the man had been detained in Rhyl. All units were stood down, and the ILB returned to station at 1932. The combination of an offshore breeze, warm sunny day, and an ebbing tide in the afternoon, kept Rhyl’s ILB crew occupied. Holyhead coastguard requested ILB to assist local coastguard and lifeguards searching for a 4-year old child on Prestatyn Nova beach. As the crew were assembling, the lifeguards reported the child was found safe and well on the beach. launch cancelled. Classed as standby. Rhyl beach lifeguards requested ILB to launch to 1 adult and 3 children being taken out to sea in an inflatable dinghy with the offshore breeze, about 300m out from Sunnyvale camp, Kinmel Bay. The ILB launched and took the occupants into the ILB and returned them and their inflatable dinghy to the shore, where they were given safety advice by the local coastguard team. The ILB returned to station at 1431. The ILB was diverted to Prestatyn beach for an inflatable being blown out to sea. The crew found the inflatable with no-one on board, but it was confirmed by the lifeguards on shore that the people from the dinghy were safe ashore as well. The ILB returned to station at 1735. ILB crew paged to assist beach lifeguards and coastguards search for a child missing on the beach off Rhyl Skytower. all units were stood down at 1810 when the child was found on Rhyl beach by the lifeguards. The ILB returned to station at 1820. ILB crew paged to recover 4 persons on a sandbank, cut off by the incoming tide, at Pensarn beach, Abergele. As the ILB was launching, it was reported all were safe ashore. The ILB returned to station at 1128. ILB crew paged to assist police, lifeguards and coastguards search for a vulnerable male missing on Prestatyn sands. Person was found safe and well ashore, and the ILB returned to station at 1418. Rhyl volunteer coastguards and beach lifeguards requested the ILB as back up after lifeguards entered the water to assist a young male shouting for help about 100 metres out off the boathouse. The ILB launched and got on scene in less than 1 minute, to find the lifeguards had assisted the man back too shallow water, and so the ILB crew stood by. however, the tide had come round the sandbank nearer the shore and was over waist deep, so the male and the lifeguards were taken on board the ILB and transferred around the sandbank to the waiting lifeguard and coastguard vehicles. The male did not require any further medical attention, and the ILB returned to station at 1725. The ILB was launched to a 3.5m inflatable with 2 persons on board, drifting about 400m out off Rhyl Suncentre. On coming alongside, it was realised that the men were drift-net fishing and were hauling in the net. They had no navigation lights showing, and had no safety flares or lifejackets or radio on board. As they were hauling their nets, the ILB crew stood by them and escorted the boat back to Garford Road slipway at Splash point, where they were met by the Rhyl coastguard team for a bit of safety advice. The ILB was back on station at 2325. The ILB crew were already at the boathouse after a publicity visit when it was noticed a male was stuck on a sandbank directly off the boathouse, with the tide fast coming in. The coastguard was notified and the ILB was launched in the gutter between the sandbank and the shore, and the crew recovered the male, who was not from the UK, and was unaware of the tidal conditions. He was returned to the boathouse and the ILB was made ready for service at 1524. ILB crew paged to assist police with man threatening to jump off the blue bridge in Rhyl harbour. As the crew were assembling, police told Holyhead Coastguard the man was in custody. Launch cancelled at 2146. Classed as standby. ILB crew paged to launch to 2 adults and 1 child cut off by the incoming tide off the boathouse. As the crew were assembling, the council beach lifeguards attended and waded waist-deep across the gulley to assist the 3 back to shore. ILB stood down at 1236 as all were now safe ashore. Classed as standby. ILB crew paged to assist person in the water at Pensarn beach. When the crew got on scene the person was out of the water and safe. The crew checked to see if anyone else was involved, then returned to station at 1300. Pagers set off again for ILB crew to go to a small day boat about 1/2 mile west of the station, who appeared to be lifting the cover of their outboard, and not being able to start their engine. The crew were just coming alongside when the boat engine fired, and then the boat left the scene at high speed, apparently all OK. The ILB crew monitored the situation, then returned to station at 1356. Rhyl coastguard team were paged after Holyhead coastguard received a 999 call regarding an object floating about 3/4 mile out from Pensarn beach, Abergele. The coastguard team could not make out what exactly the object was, and so the ILB was launched to investigate. They were directed to the location by the coastguards, and the object turned out ot be a 6m long tree trunk. To avoid further calls, the tree was towed back to the beach. The ILB returned to station at 1535. The ILB crew were paged to assist local coastguards and police to recover 2 adult males who were at the water’s edge, having previously been in the water. They were having an argument and kept going back to the water, even crossing the river Clwyd. The ILB crew went to the scene in case the 2 went back in the water, and the LandRover was used to transport local police to the site, about 1 mile out on Rhyl beach. Eventually the 2 agreed to go back to the promenade, and the LandRover was used to get them back to the boathouse in police custody, and they were seen there by local ambulance crews, but were taken from the boathouse in a police car. The ILB was ready for service by 1915.Classed as a shore-based service. It was brought to the mechanic’s attention on station that there were 2 adults cut off by the incoming tide, on a sandbank off Rhyl west promenade. The mechanic and another crew member went to the sandbank in the station LandRover, through a gulley with a depth of 0.3m, and took the 2 adults on board. Coming back through the gulley, the water was about 0.5m deep, in just a few minutes. The pair were oblivious to the incoming tide, thinking the water would stay at the depth it was. They were returned to the promenade after a short lesson in tides by the mechanic, and the LandRover returned to station at 1447.Classed as Shore Based Service. ILB crew and local coastguard team paged to immediate readiness to assist police with a person threatening suicide to the east of Splash Point, Rhyl. The crew assembled, but were informed by a local police officer that the person had been detained and the crew could stand down. This was passed to the Coastguard, and the crew stood down at 2045. ILB launched and local coastguard team alerted to an 18′ yacht aground at the entrance to Rhyl harbour. On scene, it was apparent the yacht ahd broken its moorings in the harbour, and there was no-one on board. The yacht was returned to a mooring in the harbour, and the ILB returned to station at 1124. Rhyl ILB and Coastguard team mobilised to report of inflatable in water off Splash Point, Rhyl East. The object turned out to be a load of helium party balloons! 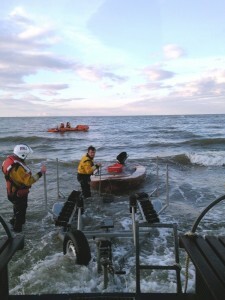 They were recovered by the coastguards as the ILB arrived on scene. The crew were back on station at 1424.